A clean and simple necklace for your minimalist style. Handmade by refugees in the US. 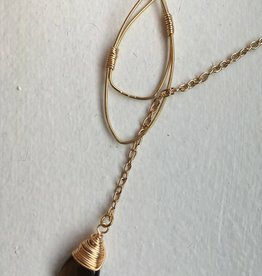 A delicate gold-wrapped smoky quartz necklace that dresses up or down! Handmade by refugee women in the U.S.
A delicate drop of moonstone gathered up in gold wire. Handmade by refugee women in the U.S.
A classic teardrop shape is accented by a single cobalt jasper bead. Handmade by refugees in the US. 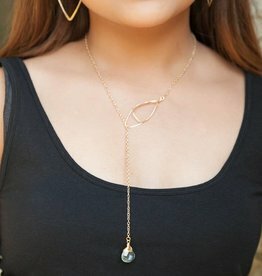 A delicate gold-wrapped aqua quartz necklace that dresses up or down! Handmade by refugee women in the U.S.
Named for the language of the Karenni people, these hammered brass earrings have a modern diamond shape with a dangle of polished amazonite. 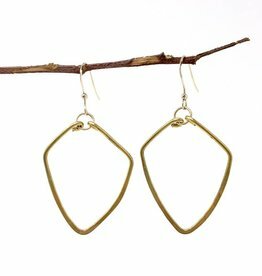 Handmade by refugee women in the U.S.
Hand-hammered brass diamond shape earrings. Handmade by refugees in the US. Petite earrings feature an smoky quartz bead gathered up in delicate gold wire. Handmade by refugees in the US. 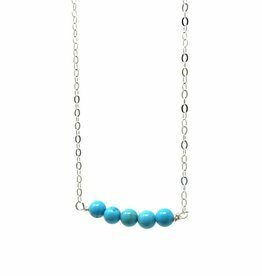 Five delicate turquoise magnesite beads create the bar in this short necklace. Handmade by refugees in the US. 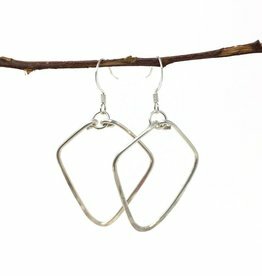 Hand-hammered silver diamond shape earrings. Handmade by refugees in the US. Petite earrings feature an aqua bead gathered up in delicate gold wire. Handmade by refugees in the US.